Not to be confused with Bowser Jr..
Jr. Troopa (or Master Jr. Troopa, as he calls himself) is a young Koopa who never left his egg after he was born. He is a bully that lives near Goomba Village who likes to pick on other kids. Jr. Troopa has his own piece of territory which he likes to call "Jr. Troopa's Playground". Throughout the game, Jr. Troopa trails Mario and his allies during their quest to save the Star Spirits from the clutches of the Koopa Troop. After each defeat, Jr. Troopa returns in a stronger form. In the last fight between Mario's party and Jr. Troopa (in Bowser's Castle), the young Koopa switches between all of his previous abilities. However, like every other time before, Jr. Troopa is defeated by Mario and his friends. The many forms of Jr. Troopa. Early in the game, Mario and Goompa travel to Jr. Troopa's playground to find the Goomba's missing Hammer and Goombaria's dolly. Eventually, they find the Hammer and her doll head back to Goomba Village. However, Jr. Troopa discovers Mario and Goompa are in his territory and challenges Mario to a fight. Mario defeats the Koopa, and then heads on his way. After Mario saves the first Star Spirit from the Koopa Bros., Jr. Troopa ambushes him on his way back to Toad Town. During this fight, Jr. Troopa hides in his shell, raising his defense. However, Mario once again beats the young Koopa. Jr. Troopa next appears in Forever Forest. He is lost and scared, so at first he is "glad" to see Mario, but he remembers that Mario is his enemy and Jr. Troopa attacks. Jr. Troopa's new ability is flight. Nevertheless, Mario beats Jr. Troopa, again. Still chasing Mario, Jr. tracks Mario to Lavalava Island, swimming all the way across the ocean. However, just as Jr. Troopa arrives, Mario leaves on the back of a Whale, forcing Jr. Troopa to turn around and swim back across the ocean, instead of flying. Jr. Troopa arrives at the harbor in Toad Town and challenges Mario. This time, Jr. Troopa has placed a spike on top of his head to go with his wings. However, all the swimming had lowered Jr. Troopa's HP to twenty. Jr. Troopa appears once again in Shiver Snowfield, though Mario can learn from the penguins that they were talking about him making a ruckus. Jr. has learned some magic and uses a wand-like stick to create balls of damaging magic. After Mario defeats him, he gets frozen in a block of ice before he has time to recover. Jr. Troopa makes his final appearance in Bowser's Castle. Jr. Troopa appears just as Mario is preparing to face the Super Ultra Mighty Koopa Bros. the Great. He beats the Koopa Bros. himself and proceeds to challenge Mario. After Mario defeats him, Jr. Troopa then runs away shouting that he will never give up. Jr. Troopa is later seen fighting Kammy Koopa during the ending sequence of Paper Mario. Both end up attacking Bowser by accident, and get burned to a crisp by him. Jr. Troopa makes a cameo appearance in Paper Mario: The Thousand-Year Door. In the photograph included with Zip Toad's email, Jr. Troopa can be seen flying in the background. Jr. Troopa also makes an appearance in the Paper Mario arcs of Super Mario-Kun. He plays the same role as he does in the game: he interferes with Mario and his partners' progress. As in the games, he uses various power-ups to aid him in the fight, but in the end, he is always defeated. "That's Jr. Troopa. He used to boot us out of the forest near Goomba Village. He thinks he's pretty tough. As far as I can tell, he goes around picking fights with people who are stronger than he is. Talk about dumb! His hobbies are working out and ordering stuff by mail." Tattle Mario, this is Jr. Troopa. He's the boss of the neighborhood gang. A bit of a bully, obviously. He's more bark than bite. You can beat him easily. Just boost yourself up and don't take any lip! I'll stay right here behind you and watch your progress. Tattle What was his name? Jr. Troopa? I don't remember exactly... ...Just joking, kid! Max HP: 15, Attack Power: 2, Defense Power: 1 He looks so adorable hiding in his egg, doesn't he? So cute! It should be a snap to beat him now. ...I think. Tattle It's Jr. Troopa. I can't get enough of this guy! Waa ha ha ha! Did the little guy get lost in the big, bad forest? Max HP: 40, Attack Power: 5, Defense Power: 1 Apparently he's grown wings, so he can fly now. You'll have to jump to reach him. He's a bit stronger, so it may be worth it to use any items you have to attack him. Tattle It's Jr. Troopa! He swam all the way after us! This kid...he's got guts! Max HP: 40, Attack Power: 6, Defense Power: 1 He still flies but now he has a spike on his head. It'll hurt if you jump on him. He seems tougher this time... Luckily for us, he also looks pretty tuckered out. Well, he should be tired. The little guy swam to Lavalava Island and back! It seems better to attack from a distance with an item or something, rather than attacking him directly. Tattle It's Jr. Troopa! I'm stunned! Really! This guy just will not quit! Max HP: 50, Attack Power: 8, Defense Power: 1 He's obviously been training. It seems he can use magic now. Sigh... Let's get this over with. Tattle It's Jr. Troopa again! My man! The little guy still has some egg shell left on his body! Aww! Max HP: 60, Attack Power: 8, Defense Power: 2 Whoa! He's been working out! He looks as though he may be able to change his shape, too. You've got to love this guy's effort, Mario. To follow us all the way here? What dedication! Come to think of it, how do you think he got here, anyway? Kowappa 「小童」 Kowappa is a derogatory term for a young boy (like "brat"). Jr. Troopa breaks the fourth wall when in the fourth fight that he notices his HP bar has dropped in half. At the beginning of the game, Goompa states that Jr. Troopa is the boss of a "neighborhood gang", but none of its members, other than Jr. Troopa, were ever seen. 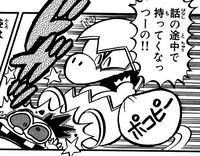 In one of his conversations with Mario, Jr. Troopa accidentally calls himself Jr. Koopa. During Chapter 3, Jr. Troopa encounters Mario in Forever Forest as soon as the latter obtains the Super Boots in Boo's Mansion and tries to leave the forest. During Chapter 5, he appears on Lavalava Island as soon as Mario leaves on the Whale once he obtains Sushie. This is likely due to the fact that, once Mario has those items, he can activate Warp Pipes in Toad Town Tunnels that connect with those areas, which would otherwise cause the player to skip a Jr. Troopa battle. The player can hammer him after beating him at Toad Town and Shiver Field (the former after returning from Lavalava Island), with him grunting in pain afterwards. This page was last edited on November 1, 2018, at 14:35.